A disappointing sales draw for Infocom during its release in 1985, Steve Meretzky's A Mind Forever Voyaging has gained steady respect in the decades since. It is now considered by some to be one of the true classics of the early Interactive Fiction form, and far ahead of its time in terms of subject matter, approach to storytelling, and quality of writing. Strongly political in nature, the game initially contained almost no puzzles, but added them after testing revealed confusion about the lack of them. Meretzky has said he wrote this game as a reaction to Reaganomics and the policies of the Reagan Administration, trying to show, via trends, where the policies enacted by the administration would lead. The title derives from Book III of The Prelude by William Wordsworth (1850): "A mind forever voyaging through strange seas of thought, alone." Often refered to by the initialism AMFV. Inspired Potsticker (Nick Montfort; 2000; Z-code), entered in Speed-IF 13. According to Steve Meretzky, the joke nickname for the game was "Steve Meretzky's Interiors", a reference to Woody Allen's Interiors, the comedy filmmaker's first major move into "serious" cinema. A Mind Forever Voyaging (Steve Meretzky; publisher: Infocom; 1985; Z-code 4). A Mind Forever Voyaging at Peter Scheyen's Infocom Homepage. 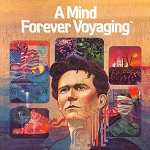 A Mind Forever Voyaging manual in PDF format - at The Infocom Documentation Project. A Mind Forever Voyaging at Wikipedia. A Mind Forever Voyaging - at IFDB. A Mind Forever Voyaging - at Home of the Underdogs. A Mind Forever Voyaging at TV Tropes Wiki. A Mind Forever Voyaging - at SPAG. How It Begins, Notable Features, full version info. This page was last modified on 20 October 2014, at 04:47.